Scotia Capital, the wholesale banking arm of Scotiabank, had a record year in 2009 for its equity platform. The bank participated in 211 equity deals, valued at $8.5 billion. In September 2009 Scotia Capital was joint bookrunner for Barrick Gold's treasury offering of $4 billion of common shares. It also was the number-one underwriter of corporate debt in Canada last year. Scotia Capital was lead bookrunner of a $380 million subscription receipt offering that enabled Great Lakes Hydro Income Fund to acquire 15 hydroelectric facilities and a wind-farm project. J.P. Morgan was the leading underwriter for both high-yield and investment-grade corporate debt in the US in 2009. The bank underwrote 331 investment-grade deals, with proceeds of $94.6 billion. It remained number one in the first quarter of 2010, with an additional $33 billion in proceeds from investment-grade debt. J.P. Morgan also was the top underwriter of equity and equity-related issues in the US in the first quarter and led in US common stock and convertible bond issues. BNP Paribas, France's largest bank, is one of the top investment banks in Europe's debt and equity capital markets. The corporate and investment banking division has 17,000 employees in 53 countries. BNP Paribas was the financial adviser on 54 M&A; transactions involving France-based companies in 2009, more than any other bank. It was number two in terms of deal value. Deutsche Bank's trading and investment banking revenue doubled in the first quarter of 2010 from the same period a year earlier. Deutsche Bank's corporate and investment bank contributed more than 90% of its earnings in the first three months of this year. Deutsche Bank was the only European bank selected as a lead manager on Agricultural Bank of China's upcoming record $29 billion IPO. Mediobanca, Italy's leading investment bank, serves its share of major corporations in Italy but has been shifting its focus in recent years to mid-size companies. Mediobanca was the number-one financial adviser on mergers and acquisitions involving companies in Italy in 2009. It advised on 33 such deals, valued at $30 billion, according to Thomson Reuters. ING was the number-one adviser on M&A; transactions in the Netherlands last year, both in terms of volume and value. It also was number one in the equity capital markets in the Benelux region by volume and the leading bank for debt capital markets in the Netherlands. ING was sole lead M&A; adviser to TeneT, the Dutch state-owned utility, on its acquisition of E.ON's high-voltage power grid in Germany. Caixa-Banco de Investimento (CaixaBI) is the investment bank arm of Caixa Geral de Depósitos, the largest banking group in Portugal. It opened an office in Brazil last year and was co-manager of Banco Santander Brasil's $8 billion IPO. CaixaBI was the number-one bookrunner for corporate bond issues in Portugal in 2009. It also was the leading adviser in Portugal's equity capital market. Troika Dialog is the oldest and largest independent investment bank in Russia and the Commonwealth of Independent States. It operates in 21 cities in Russia and is the leading financial adviser on Russian M&A; and restructuring deals. Troika is also the leader in Russian equity sales and trading on behalf of clients worldwide. The firm is active in the Russian, Kazakh and Ukrainian bond markets. Santander, the biggest bank in Spain and one of the largest in Europe, is beefing up its investment banking operations. In Brazil the bank raised $8 billion last October by selling a 16% stake in Banco Santander Brasil in an initial public offering. Santander's global operations are helping it weather the economic slump in its home market. Credit Suisse ranked number two in Europe and number one in the UK in advising on mergers and acquisitions in 2009, according to Thomson Reuters. The bank also has been focusing on building up its debt-trading operations. Credit Suisse was a lead manager on Qatar's $7 billion sovereign debt issue last year, which was the biggest emerging market bond offering ever. Garanti Securities, the leading securities firm in Turkey, offers capital markets products and advisory services. The firm is advising the Privatization Administration of Turkey on the sale of Ankara's natural gas distribution company, Baskent, a monopoly in the capital city. The brokerage services of Garanti Securities are delivered through the extensive branch network of Garanti Bank. Barclays Capital took the number-two spot on Thomson Reuters' ranking of bookrunners for global debt issues in 2009. The bank led Indonesia's $650 million sukuk issue, the country's first international sale of Islamic dollar-denominated bonds. UBS has been a consistent leader among financial advisers for Australian M&A. ; It led again in the 12 months to March 1, 2010, by advising on 27 deals, valued at $30.8 billion, giving it a 33% market share. UBS was sole financial adviser to state-owned China Minmetals, which acquired most of the assets of OZ Minerals for about $1.4 billion, the largest acquisition by a Chinese company in the Australian mining sector. CICC was the number-one underwriter of initial public offerings in China in 2009. Agricultural Bank, China's only unlisted state lender, selected CICC as an underwriter for its dual listing in Hong Kong and Shanghai this year. The IPO could raise $29 billion, making it the world's largest listing ever. Kotak Mahindra's Kotak Investment Banking (KIB) subsidiary was lead manager in 10 of the top 15 initial public offerings in India last year. So far this year it has managed IPOs for DB Realty, Hathway Cable & Datacom, and Jubilant FoodWorks, operator of the Domino's Pizza chain in India. In July 2009 KIB advised Tech Mahindra on its acquisition of a controlling stake in Satyam Computer Services. Mandiri Sekuritas is the investment banking and securities arm of state-owned Bank Mandiri, the largest bank in Indonesia. Mandiri Sekuritas was the top equity underwriter in the country last year, with a 28% market share. It was lead manager for the privatization of Bank BTN, Indonesia's largest mortgage-financing bank. It also led initial public offerings for Metropolitan Kentjana, a property developer, and Trikomsel Oke, a mobile-phone services provider. Nomura is the leading securities firm and investment bank in Japan. In November 2008 it acquired Lehman Brothers' businesses in Asia, together with its investment banking and equities operations in Europe and the Middle East. While Nomura is expanding in global markets, it remains number one on its home turf. It was the leading corporate bond underwriter in Japan from March 2009 to March 2010. Citi is the leading investment bank in Singapore in both M&A; advisory and equity issuance. In November 2009 it advised Chartered Semiconductor on its $3 billion sale to ATIC. Citi also was exclusive financial adviser to Prudential earlier this year in a competitive bidding process for UOB Life Assurance. The bank was joint bookrunner on Tiger Airways' IPO. Samsung Securities is South Korea's leading brokerage firm and a full-service investment bank. In the past year it has been building up its Hong Kong-based operations. In December of last year Samsung Securities (Asia) advised Germany-based Schramm Coatings on its initial public offering. Schramm was the first German company to be listed on the Hong Kong Stock Exchange. Fubon Financial Holding is a consistent leader in both the debt and equity capital markets in Taiwan. It also advised on several major M&A; transactions in the semiconductor industry last year. Fubon has efficient distribution channels and knowledge of local industries. The firm gets involved in transactions at an early stage and has demonstrated the ability to manage financings in difficult market conditions. Citi was joint lead manager and joint bookrunner for the first international bond issued by the world's largest McDonald's franchisee, Buenos Aires-based Arcos Dorados. The $450 million offering of 10-year bonds in September 2009 was heavily oversubscribed. Citi also led a $50 million bond for Frávega, a home-appliance retailer, the first in Argentina since the nationalization of the country's pension funds in October 2008. BTG Pactual is the largest independent investment bank in Brazil and Latin America. It was formed in 2009, when global investment firm BTG acquired UBS Pactual from UBS for $2.5 billion. The firm represented ethanol producer Cosan earlier this year in its joint venture with Royal Dutch Shell. BTG Pactual was the number-one Brazilian equity bank, with more than $20 billion worth of deals in the 12 months through March 1, 2010. It was second in the number of Brazilian M&A; deals on which it advised in the same period. Citi led Cemex, the largest producer of cement in the Americas, in refinancing its entire bank debt with 75 financial institutions. The $15 billion transaction closed in August 2009, with approval from all of the bank lenders. In December 2009 Citi was global coordinator and sole lead arranger of a $1.7 billion dual-currency secured note offering by Cemex Finance. Cemex originally announced a dollar offering, but a euro tranche was added after three days of marketing. Unicorn Investment Bank was shariah adviser and a lead manager of a $450 million, five-year global Islamic sukuk issued in February by Dar Al-Arkan, the largest property developer in Saudi Arabia. 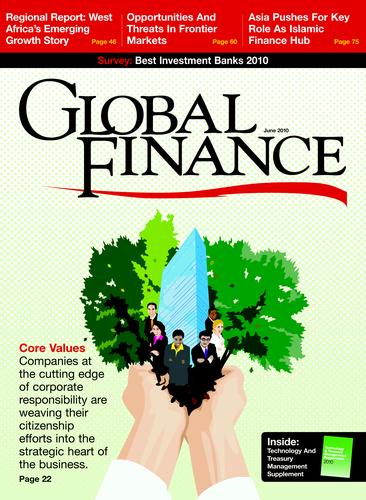 This was the first international issue from the Gulf Cooperation Council nations in 2010 and the first by a company based in Saudi Arabia to take advantage of Rule 144A, which exempts private placements with qualified institutional buyers from registration with the US Securities and Exchange Commission. As a result, US investors were able to participate directly in a Saudi issue for the first time. Cairo-based EFG-Hermes is a leading investment bank in the Arab world, with 13 offices in the Middle East and North Africa. It was financial adviser to Egyptian Nitrogen Products' $1.1 billion project finance facility, the largest debt syndication in Egypt in 2009. EFG-Hermes sold its 22% stake in Bank Audi in the first quarter of 2010. It plans to transform its regional platform into a universal bank and is seeking control of a commercial bank. EFG-Hermes is the leading securities brokerage in Egypt and the UAE. HSBC's Tel Aviv branch advises Israeli companies on mergers and acquisitions, private placements and capital market activities. It arranges debt and equity offerings, including leveraged finance and structured debt. The bank is leading a group including Israel Corp, which is planning to invest $350 million in a project to build a network of charging stations for electric cars. Arab Bank is one of the oldest and largest financial institutions in the Middle East. Its corporate and investment banking services include syndicated loans, acquisition financing and structured facilities. Arab Bank is a majority shareholder in AB Capital, an investment bank based at the Dubai International Financial Center. AB Capital recently received a license to open an investment bank in Saudi Arabia. NBK Capital, the investment bank subsidiary of National Bank of Kuwait, offers financial advisory, as well as debt and equity capital markets services. It advises on mergers and acquisitions, leveraged buyouts, privatizations and restructurings. NBK Capital's mezzanine fund, the first such fund in the region, made investments last year in a fish producer and a courier service in Turkey. NBK Capital offers research on local and regional companies, stock brokerage and asset management. Beirut-based BankMed, with 51 branches in Lebanon, has a well-established corporate banking business. In 2008 it established SaudiMed Investment in Saudi Arabia, which provides investment and corporate advisory services. BankMed is part of a larger group that includes major corporations in the Middle East, including Saudi Oger, a conglomerate active in the construction industry. Other members of the group include Medgulf, a leading regional insurer. BankMuscat, the largest bank in Oman, opened a new branch in Kuwait in April 2010, extending its presence to all six countries of the Gulf Cooperation Council. BankMuscat is active in corporate and investment banking. Its international operations provide a wide range of cross-border financing services. BankMuscat signed an agreement with Bank of China earlier this year to open a China desk in Muscat. QNB Capital is owned by Qatar National Bank, which has the largest branch network in the country. QNB Capital was the lead manager of the initial public offering in January 2010 of Mazaya Qatar Real Estate Development. The investment bank advises on projects in the oil and gas, transport, power, infrastructure and property sectors. It also advises on mergers and acquisitions and debt issues. SambaCapital was the lead manager of two of the four sukuk offerings that took place in Saudi Arabia last year, including the $1.87 billion sukuk issued by state-controlled Saudi Electricity. The latter issue had the largest order book ever for any sukuk or bond in the kingdom. SambaCapital was recently named as a lead arranger of a second sukuk for Saudi Electricity. Abu Dhabi Investment Company, rebranded as Invest AD last year, was created to invest on behalf of the emirate's government. It has evolved in the past few years into a financial services company offering investment banking services and investment funds to international and regional clients. Invest AD bought a stake in Turkish logistics firm Ekol in December 2009 for its private equity fund. South Africa-based Standard Bank operates in Nigeria as Stanbic IBTC Bank. It offers local currency bonds, as well as project and structured finance. Stanbic IBTC arranged a $2 billion syndicated facility for MTN Nigeria Communications. It also was the international arranger and chief lender for the $427 million Lekki-Epe Expressway. The largest South African banking group, Standard Bank was joint lead manager in March 2010 for the record $2 billion global bond issued by South Africa. The dollar-denominated issue was registered with the US Securities and Exchange Commission. Its 5.5% coupon was the lowest ever achieved by South Africa in the dollar market.